Today, authors Maren and Jamie Showkeir recognize these obstacles in the workplace. 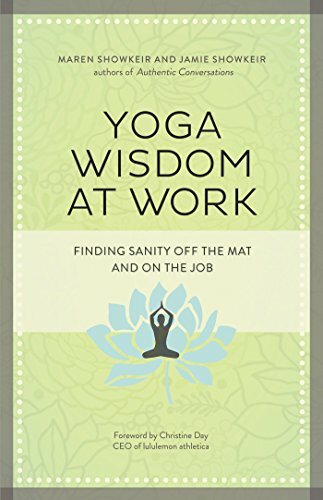 In Yoga Wisdom at Work they show readers how to take yoga “off the mat” and into the workplace for more success and sanity in high-stress environments, helping them become more productive workers, more skillful managers, and more effective leaders. The first two limbs are about universal moral codes (the yamas) and personal observances/conduct (the niyamas). They are instructive about forming intentions, making choices about action, and understanding consequences. The yamas include non-violence, no lying, no stealing, no squandering of vital energies, and no greed or hoarding. As the authors point out, these observances also include the flip side. For example, cultivating kindness and compassion toward others goes far beyond just practicing non-violence. Or recognizing that sometimes silence can be a violation of truthfulness. Or that developing the quality of generosity is greater than just no stealing. Yoga Wisdom at Work continues with the niyamas, which help one improve productivity, ethics and serenity at work: cleanliness, contentment, self-study, discipline/energy, and surrender. Some of the advice is difficult to follow in the modern workplace, where there is constant competition and demand for results. But stories and examples abound from all types of jobs and contemporary media, so readers can find ways to develop a personal presence and integrity that will stand ready in any situation, no matter how stressful, complex, or sensory-overloaded. In their work, the Showkeirs have found that businesses are recognizing the benefits gained when employees are grounded, clam and focused. They use more than half the book to concentrate on yamas and niyamas before proceeding with the next six limbs: asana (physical postures), pranayama (breath control), pratyahara (withdrawal of the senses), dharana (focus/concentration), dhyana (meditation), and samadhi (absorption). While yoga asana can be seen as a metaphor for qualities needed to be successful at work (intention, discipline, focus, stability, strength, flexibility, balance, willingness to try something new), Yoga Wisdom at Work contains no asana instruction. It does include five suggestions for practicing each of the eight limbs, at the conclusion of each chapter. Additionally, three pranayama techniques are instructed. And there’s a simple five-part meditation practice based on neuroscience, intended to connect a desired behavior with breathing, body awareness and positive mood so that readers can gain mental mastery of thoughts and actions. Yoga Wisdom at Work is thoroughly indexed. Resources are cited. Most Sanskrit terms are sufficiently explained in the text, so the glossary is minimal. The Showkeirs write, “the point of yoga is samadhi (absorption).” So is the point of work, and life! Yoga Wisdom at Work is highly recommended for anyone with or without a physical yoga practice who wants to work and live in a state of steady, calm, focused concentration. Birgit W. Patty is proprietor of Apex Yogic Living in Apex, NC. She is a perpetual yoga student and a certified Integral Yoga teacher.